Stephen Colbert Brings Showmanship — And Harmony — To His 'Late Show' Debut The opening Late Show with Stephen Colbert was so packed with business, guests and music, it went several minutes overtime. But TV critic David Bianculli says "it didn't feel long. It felt good." New Late Show host Stephen Colbert (right) talks with actor George Clooney. First nights on TV talk shows provide quick, and sometimes misleading, first impressions. 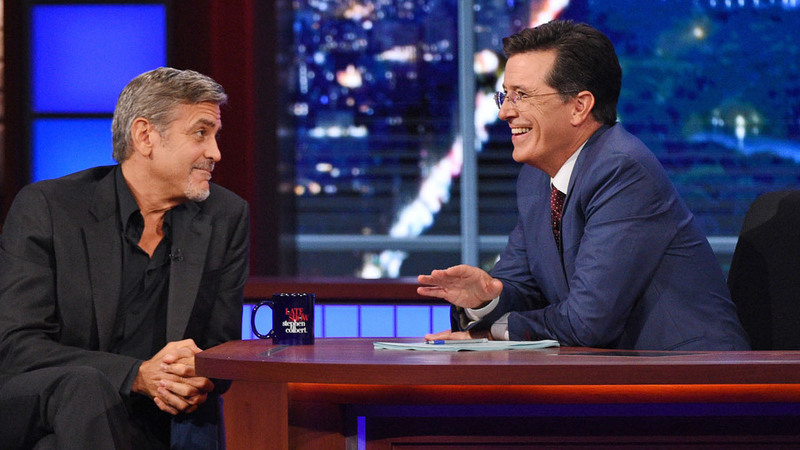 As Stephen Colbert joked in his opening monologue, he had nine months to plan his first show. But first impressions do count for a lot, especially about the structure — and atmosphere — a new host brings to the job. Colbert didn't mess with the existing structure of the Late Show itself — opening monologue, sit behind a desk, interview a few guests, showcase some music at the end. But the interior structure of the Ed Sullivan Theater was significantly different — so much so that one of the opening-night guests, Republican presidential candidate Jeb Bush, took note. Colbert opened the show with a film montage, showing him singing harmony on "The Star Spangled Banner" with various people across the country — and closed it by joining new Late Show bandleader Jon Batiste, and his band Stay Human and special guests, on a high-energy performance of Sly and the Family Stone's "Everyday People." As Colbert has proven by performing in a concert version of Stephen Sondheim's "Company," he really can sing. Colbert acted as his own announcer, introducing the evening's talent — including himself. He did a solo comedy bit, gorging on Oreos in response to Donald Trump's recent rejection of them. He delivered a short but solid monologue, and — interviewing his guests as himself rather than the character he played on Comedy Central — played straight man to George Clooney and genial inquisitor to Bush. Showmanship is something Stephen Colbert knows very, very well. That's why the choice of Batiste as bandleader is such a good move — as good as Jimmy Fallon's move to appoint The Roots as the house band for NBC's Tonight Show. Fallon, too, showed up in a friendly filmed cameo, so Colbert was acknowledging the present leader of late-night TV. But Colbert, whose sentimental but heartfelt salute to Jon Stewart was a highlight of Stewart's final Daily Show, also found time, on his first Late Show, to salute his predecessor David Letterman properly — and graciously. On Colbert's opening Late Show, he made it a welcome sandbox, for Republicans as well as Democrats — an instant and important distinction from The Colbert Report. Bush, Clooney, Batiste, even Colbert — everyone seemed to enjoy himself. And that's an emotion that translates very well through the TV set. The inaugural Late Show with Stephen Colbert was so packed with comedy bits, special guests and music, it went several minutes overtime — but it didn't feel long. It felt good.